Paguera (or Peguera) is located in the southwestern corner of Mallorca, nestled between Santa Ponsa and Port d’Andratx. The holiday town is 31 kilometres from the airport and served by the motorway. 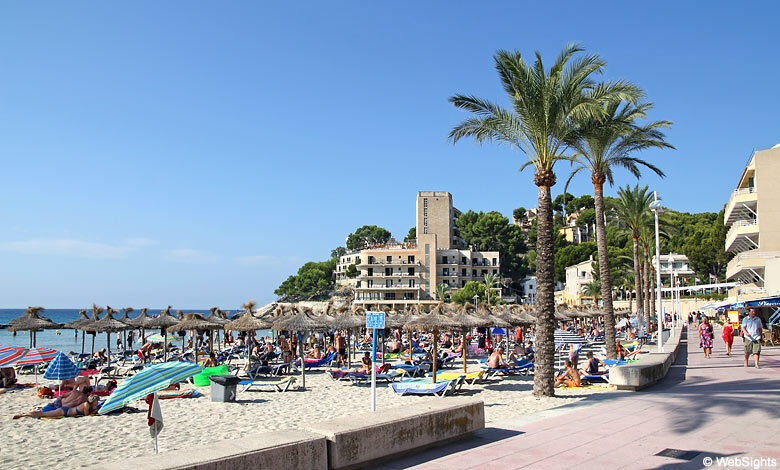 Paguera was one of the first holiday destinations established on Mallorca and much like the neighbouring towns of Camp de Mar and Costa de la Calma, it has always been popular amongst German tourists. Although still popular with the Germans, an increasing number of visitors are from the UK and Scandinavia. There are three wonderful beaches in Paguera, all connected by a lovely beachside promenade. The main beach by the name of Playa Palmira is the biggest as well as the most central. The other beaches are known as Playa de Tora and Playa la Romana. All three are shallow, white-sand beaches that offer all the usual amenities, such as sun loungers, parasols, showers and toilets. In the high season, there are lifeguards stationed at all locations. Playa Palmira tends to fill up in July and August while there is usually a fair amount of space to lay down your towels on the other two beaches. 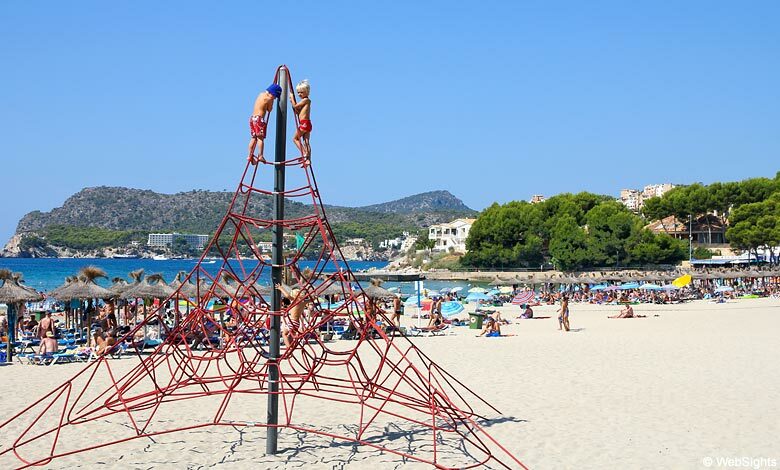 All three beaches are incredibly child-friendly. The sand is lovely, the water is shallow, and the waves that do come to shore are nothing to worry about. There are plenty of water sports to choose from at all three locations, including windsurfing, water skis, banana boats and pedalos. If diving is more up your alley, look up one of the two diving schools in Paguera. 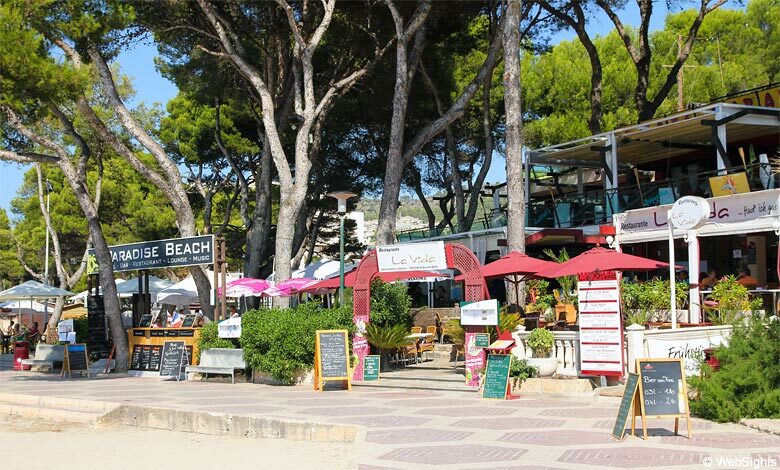 The lovely beachside promenade is dotted with restaurants, cafés and bars. There are also plenty of options to buy beverages, ice cream and sandwiches to bring to the beach with you. The well-kept, low-rise buildings and innumerable green spaces in town make Paguera one of the prettiest holiday destinations in Mallorca. You can find a selection of restaurants, cafés, and interesting shops along the quiet main street, Bulevar de Paguera. 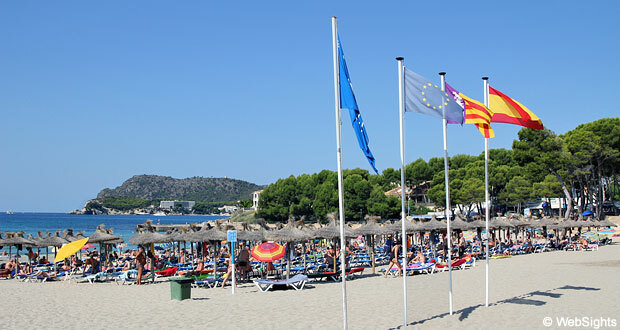 A lot of German tourists consider Paguera to be the best holiday destination in Mallorca. It probably helps that there are a lot of German restaurants, a German hospital, a German bank and even a German bookshop in town, but the number of visitors from other countries has also been on the rise in recent years. The town borders on a large forest that is perfectly suited for hiking and cycling trips. Within a 15-mile radius of Paguera, there are golf courses and other activities for the whole family to enjoy, including Western Water Park. Paguera isn’t far from the shopping and culture capital of Palma de Mallorca. The three beaches in Paguera. 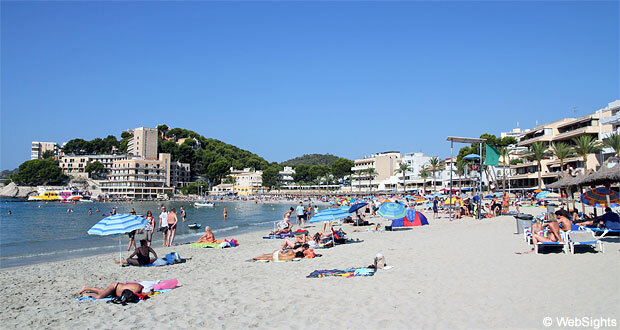 The main beach, Platja Palmira, is on the left. The beach in the middle is Platja de Tora while the one to the right is Platja la Romana. 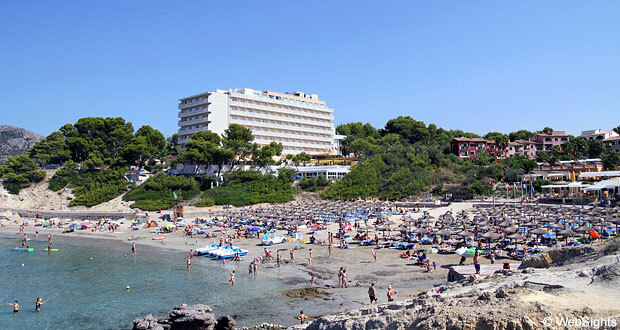 Santa Ponsa is located southeast of Paguera.